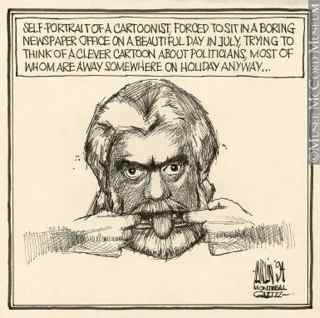 A multimedia retrospective on the career of Gazette cartoonist Terry Mosher is but one of the gems you can find on the McCord Museum website. Join us as we unearth the hidden gems and secret places on the websites of McGill University and its affiliated institutions. No matter how many times you visit the McCord Museum’s spectacular and sprawling website, there will always be something new to surprise and thrill you. Case in point: their thematic historical tours, a collection of more than 75 multimedia presentations – essentially mini-documentaries with sound, movies and still images – on a huge range of subjects. Themes include First Nations, cartoons, places, people, society/daily life, politics/economy and technology, industry and commerce. Check out the retrospectives on the careers of famed political cartoonists Terry “Aislin” Mosher and Serge Chapleau, the origins of the consumer society in Canada; and a fascinating over (and under) view of women’s fashions, and how they evolved with and influenced the rise of the feminist movement. Free electronic books have been available on the Internet for years, through non-profit, public domain sites like Gutenberg.org and the Internet Archive, and more recently through commercial, ad-supported sites like Wowio.com. This McGill Library resource lists most of those sites and several others you may not have heard of. Perhaps more importantly, members of the McGill community have privileged access to a much broader range of ebooks – many of them hot-off-the-presses reference and text books – not available on the public Internet. The McGill Library has subscriptions to vast ebook databases like Books24x7, Oxford Scholarship Online and Safari Tech Books, to name only three. Do you know of any great McGill web gems we haven’t covered yet? Please send them to mark.shainblum@mcgill.ca.